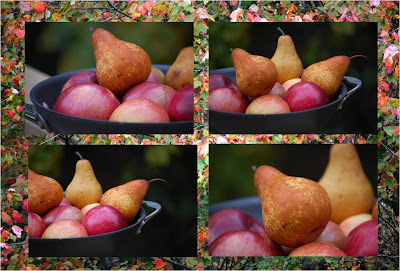 The Cooking Blog of Emilie French Chef: Apple & Pear Season ... Let's bake Muffins !! It is October and I'm truly in love with the Fall !!! It is the season for Apples picking, and the Pears are so juicy at this time of the year. As I am now done with my Confitures (Jam) for the next winter, I wanted today to use my fruits and treat myself with a yummy dessert. The leaves are already turning in pink, orange & red color in Connecticut, same colors as the Pears & Apples I have in my fridge. Perfect ... let's bake something with them !! I decided to cook my Apples and Pears in Butter and Sugar and bake Muffins with pieces of caramelised Apples & Pears inside - wouaouh, look at that ! Don't forget to sprinkle a few of Cinnamon on your fruits. It gives a delicious spicy taste to Apples.And it smells so good in your kitchen !! You know, Muffins are really a "piece of cake" to do. And the good thing is that you can always use the same recipe for the dough and just add your favorite fruits !!!!!!! I love these cute Muffin cups we can find everywhere each season. 20mn in the oven for mini Muffins and 25mn for large Muffins, and Voila !! Start with the Fruits Mixture : cut all fruits in small pieces. Heat a pan with the butter. Add the fruits and sugar and cook 5mn on medium high heat until fruits are melted and start to get a brow color (try to not mash the fruits). Sprinkle a few Cinnamon.Preheat the oven at 365dF. For the Muffin Dough: put all ingredients the bowl of your food processor and start mixing on low speed with the beater attachment. When all ingredients are incorporated, beat on high speed for 2mn. - For the mini Muffins : fill up each muffins cup and add one piece of fruit on the top of each muffin. Sprinkle some sugar and more cinnamon if you want. Bake for 20mn without opening the oven during the baking time. Add 3 more minutes until brown color. - For the large Muffins : fill up 1/2 of each muffin cup and add pieces of fruits. Complete with dough until 3/4. Sprinkle some sugar and more cinnamon if you want.